Posted by makingyourdashcount in Thoughts, Westerville, Westerville North. A close friend of ours has been diagnosed with cancer and is scheduled for surgery this week. No one on this earth is more caring and selfless, which makes the pain that he and his family are going through that much more painful for everyone he knows. This man is a fighter. If anyone can beat it, Curt can. Our prayers, thoughts and concerns are with him, his wife and 3 children. Curt was with us when we told Anna that her sister had died. Curt has been with us every step of the way through our healing. Now it is our turn. He is a man of large stature and large heart; what ever your religious beliefs and definitions– please keep Curt in your prayers and thoughts. 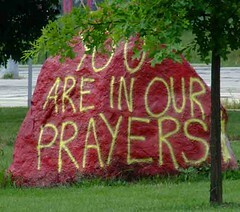 As some will recognize, the rock below (front and back) is at Westerville North. Two years ago, it was painted for Sarah, as it was on her subsequent birthdays. 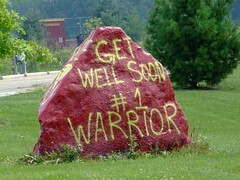 This rock has been layered in love for many fellow Warriors- whether sports teams competing or Warriors needing support. There is no question that this layer of love is one that everyone shares.